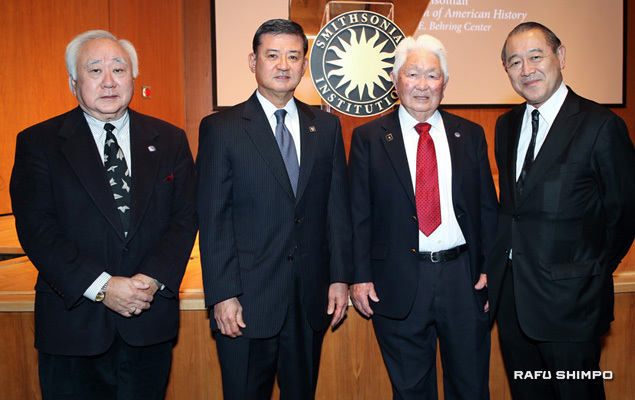 From left: Gerald Yamada of JAVA; Secretary of Veterans Affairs Eric Shinseki; MIS veteran Grant Ichikawa; and Japanese Ambassador to the U.S. Ichiro Fujisaki. WASHINGTON — The Day of Remembrance Program — sponsored by the Smithsonian Asian Pacific American Program, Japanese American Veterans Association (JAVA), National Japanese American Memorial Foundation, and Japanese American Citizens League – was held at the Smithsonian Institution’s Warner Bros. Theater, Museum of American History, on Feb. 18. The program has been held on or around the day that President Franklin D. Roosevelt signed Executive Order 9066 on Feb. 19, 1942, authorizing the forced removal of persons of Japanese ancestry from the western United States. Dr. Konrad Ng, Smithsonian Asian Pacific American Program director, gave the welcoming remarks and thanked Noriko Sanefuji for skillfully and successfully organizing this year’s event. Japanese Ambassador to the U.S. Ichiro Fujisaki was one of the dignitaries present. About 200 people attended the program. Secretary of Veterans Affairs Eric Shinseki was the 2012 keynote speaker. He recalled that his parents never celebrated their wedding anniversary because they were married on Dec. 6, 1941, and their happy event was ruined by the attack on Pearl Harbor the next day. Shinseki went on to say how proud he was of the men who served in the 100th Infantry Battalion, 442nd Regimental Combat Team, and Military Intelligence Service (MIS). He highlighted why their service deserved the awarding of the Congressional Gold Medal (CGM) last year. Their legacy will show his grandchildren what it means to be an American, he said. The CGM for the Nisei soldiers of World War II was on display during the program. The Smithsonian is planning to take the medal on tour to various cities, after which it will be displayed in the Museum of American History. A film giving the highlights of the Congressional Gold Medal ceremony was shown. A panel discussion followed with Franklin Odo, former director of the Smithsonian Asian Pacific American Program, moderating. The panelists were Grant Ichikawa, MIS veteran and JAVA member; Christine Sato-Yamazaki, chairperson of the National Veterans Network; C. Douglas Sterner, author of “Go For Broke”; and Gerald Yamada, JAVA president. Odo asked the panelists what the CGM meant to them. Ichikawa spoke about his experiences in the MIS and how proud he is to be a recipient. Sato-Yamazaki talked about the award ceremony being the completion of the difficult two-year effort to obtain congressional approved for the awarding of the gold medal. Sterner outlined why the awarding of the CGM is the highest honor that Congress can bestow. Yamada viewed the CGM as giving JAVA the challenge to make the Nisei soldiers’ legacy a living story rather than just a historic one.